Grey skies threaten overhead as I stand beneath the black wrought-iron balcony of a stately brick home on Royal Street. If New Orleans is a city that unfolds itself in jazz rhythms, today’s melody is slow and somber; lingering piano chords plink out a lonely ballad joined by the metallic runs of a trumpet. Had I simply been in search of the infamous debauchery on New Orleans’ Bourbon Street, gloomy weather might have put a damper on the mood. 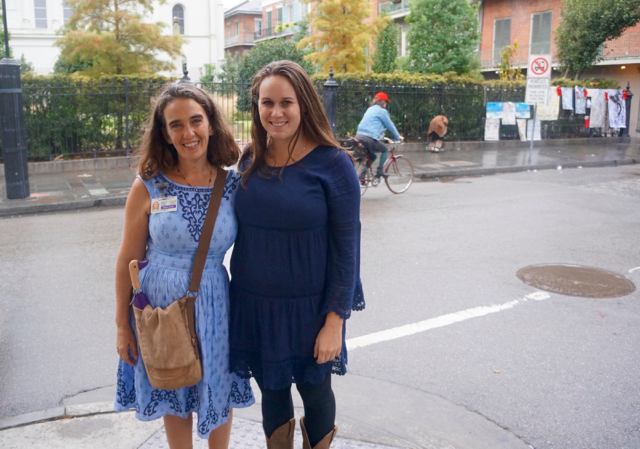 But lucky for me there’s a lot more to NOLA than collecting mardi gras beads and slurping hurricanes, and exploring the best of the city on a walking tour with Libby Bollino of Lucky Bean Tours is a rewarding experience no matter what the weather. A 10th generation NOLA resident, there’s perhaps no better person to guide a walking tour of the French Quarter than Libby as the very history of the city is ingrained in her blood. Her knowledge is a deep spring, the waters of which pour freely on our walk. The history of New Orleans is long and complex. The first Europeans to settle the area were French fur trappers and traders who arrived in 1699. In 1718 the City of New Orleans itself was established at a strategic bend in the Mississippi River under the direction of Jean-Baptiste Le Moyne de Bienville, a French explorer. The city’s next 100 years of history is rather tumultuous, switching hands from the French to the Spanish, back to the French (very briefly), before finally being sold to the United States as part of the Louisiana Purchase brokered by Jefferson and Napoleon in 1803. With the advent of steam boats, the cotton gin and new trading agreements in the United States, New Orleans boomed with prosperity for a short time, until the Civil War halted momentum. While the city was spared destruction by Union soldiers, in the years following the war the economy collapsed, never to return to the same level of prosperity as in the early 1800’s. As we stroll through the French Quarter, Libby brings this history to life, sharing architectural insights about the buildings we pass and colorful stories about the people who once called the city their playground. One of the most entertaining stories to hear was about a woman named Mary Jane Jackson, or “Bricktop.” A prostitute with fiery red hair and an infamous temper, Bricktop’s weapon of choice was a knife. She killed four men over the course of eight years, including one who had an iron ball for a hand. Now that sounds like one NOLA resident I would not want to meet! I learn that the architecture of the French Quarter is not actually French, making the neighborhood a bit of a misnomer. 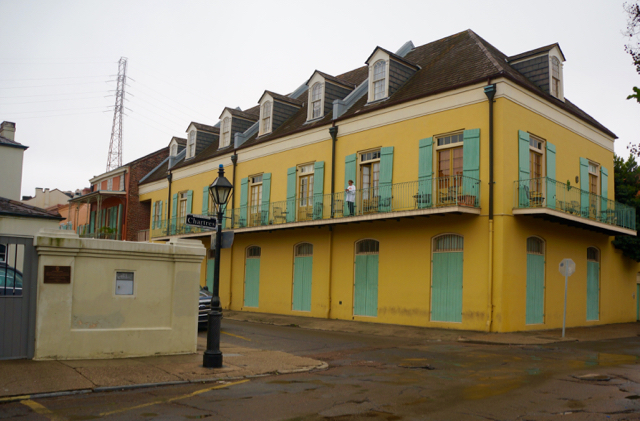 In 1788 a fire broke out at a private home on Chartres Street, destroying 80 percent of the city’s buildings. The city was then rebuilt in just six years. At this point New Orleans was a colony of Spain, so the buildings were rebuilt in Spanish colonial style, bearing striking resemblance to the architecture of Old Havana. While many other southern cities were burned during the Civil War, the Union chose to occupy the city and use it as a head quarters, saving it from destruction. After the war the economy collapsed, and for the next 75 years the city was preserved by neglect brought about my poverty. These factors are what make the French Quarter one of a kind, with such unique and historic architecture in uniform style and well preserved. 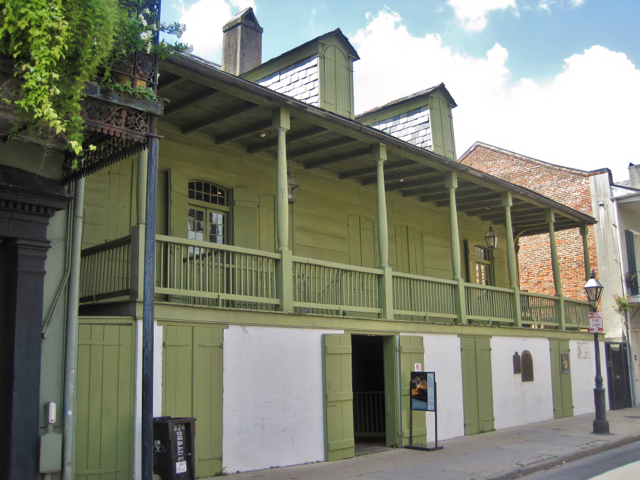 On my historical walking tour of New Orlenans with Libby we visit a wealth of historical sights from Latrobe Park and the French Markets to the Ursaline Convent and Madam John’s Legacy, a museum that has a long history but most recently was used in the filming of 12 Years a Slave. With Libby as my guide I feel myself diving deeper into the city, experiencing the sights and sounds in a way I could not have on my own. Earlier in my visit I had stopped for a café au lait and beignet (delicious French donuts) at the famed Café Du Monde, as every standard tourist does. But Libby knew a secret – around back of the café there are glass windows where you can look in at beignets being made fresh and get an understanding for how intricate and fast the process is. 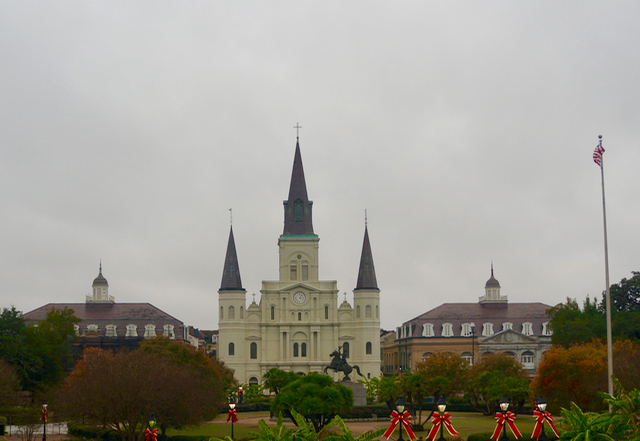 We end our tour with a view of St. Louis Cathedral, the oldest cathedral in North America and perhaps the most iconic symbol of the city. I stare at the white building, grey turrets rising stoically in the rain. I have just scratched the surface today. This city’s history is full of endless stories and secrets. 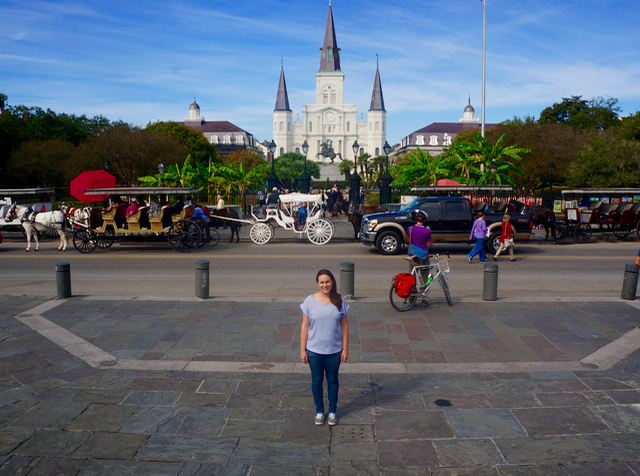 If you’re in New Orleans there’s no better way to explore the city than on a walking tour with Libby! 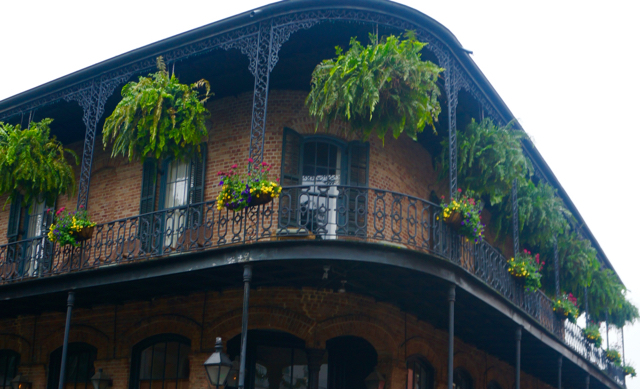 Libby offers several walking tours of New Orleans that are tailored to special interests, be it ghost and horror stories, culinary history or women’s history. 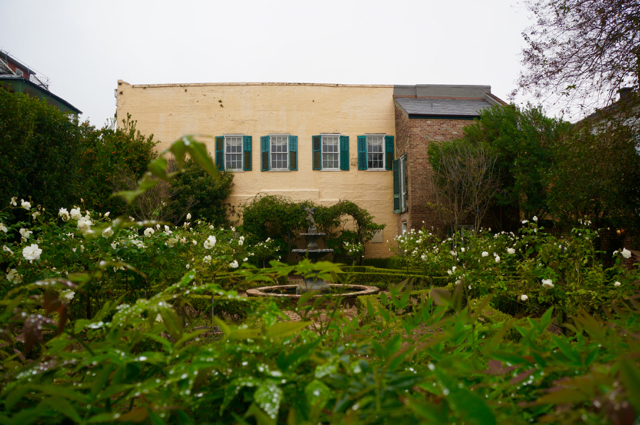 In addition to tours of the French Quarter, she also offers tours of the Garden District and St. Louis Cemetery. To book a tour with Libby visit her website, or contact her via email at info@luckybeantours.com.